Maker’s Vienna is made from premium 2-row Copeland barley. The 2018 Vintage was grown on “Horseshoe Bend” one mile from the Malt House in Rosthern, Saskatchewan. Maker’s Vienna is kilned to maximize flavour profile and aromatic punch. It is reminiscent of a heritage English malt producing a rich malty flavour with a crackery sweetness. Can be used in all types of beer and whiskey at a usage rate of up to 100%. A strong enzyme package allows this malt to be paired with non-malted and specialty grains. Also use to add malty backbone, aromatics and golden color to Pale Malts. Great for traditional English-style beers. 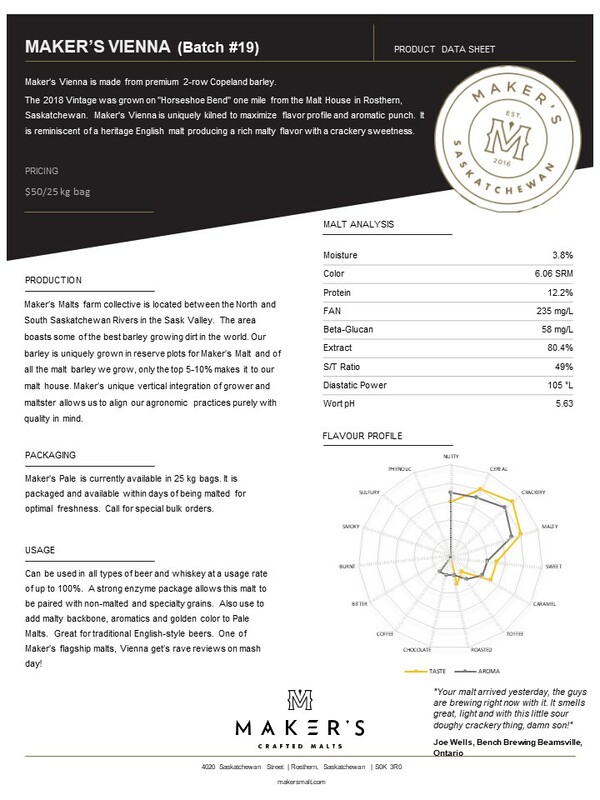 One of Maker’s flagship malts, Vienna get’s rave reviews on mash day!